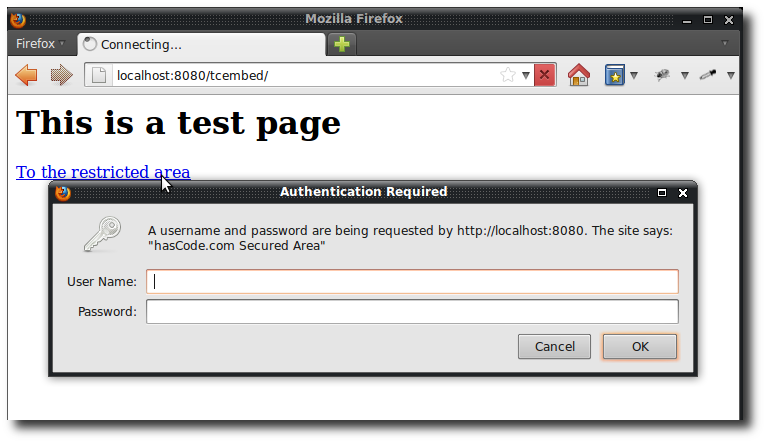 Now we need a valid user that fulfils the defined role ‘admin‘ and some credentials for his authentication. In a normal Tomcat server we could add a user to the tomcat-users.xml but here we have an embedded instance – but this is no problem .. the Tomcat Maven Plugin searches for a directory src/main/tomcatconf and if it exists it is copied to the configuration of the embedded instance. This entry was posted on Wednesday, October 12th, 2011 at 7:21 pm	and is filed under Java. You can follow any responses to this entry through the RSS 2.0 feed. You can skip to the end and leave a response. Pinging is currently not allowed. I am not sure if it is a bug, but here is what i noticed. first time i ran the application, secure info page asked for the userid and pwd which is perfect. I restrated the server, the secure info did not ask for the userid and pwd . are these credentials it cached somewhere ? This is not a bug .. using basic auth, the credentials are saved in your browser until you close and restart your browser or clear your history.